Prosecutors have dropped the breach of peace charge against Lucian Wintrich, the conservative pundit who grabbed a woman after she took papers from his podium during an appearance last month at the University of Connecticut, his lawyer said on Monday. “The state realizes that my client was in fact the victim of a theft,” Norm Pattis, who represents Mr. Wintrich, said in a phone interview. Mr. Wintrich, who writes for The Gateway Pundit, was arrested on Nov. 28 after speaking at a university event hosted by a campus Republican group, where he was videotaped confronting the woman who snatched his papers. She was later identified as an adviser at a Connecticut community college. During the speech, members of the audience shouted insults at Mr. Wintrich, interrupting him, yelling “Go home, Nazi” and “Black Lives Matter,” according to the police. The audience then began to leave the packed lecture hall around 8:50 p.m.
At that point, Catherine Gregory, 33, who works an adviser at Quinebaug Valley Community College, approached Mr. Wintrich’s podium, the police said. She took papers from the lectern, and as she walked away, Mr. Wintrich grabbed her and tried to take the papers back. The police intervened, and Mr. Wintrich was arrested. The crowd outside the hall, which numbered about 200, was also getting rowdy, the police said. Someone broke one of the lecture hall’s windows and a smoke bomb was thrown inside the hall. Mr. Wintrich was charged with breach of the peace, a misdemeanor, and was released after posting $1,000 bond, said a university spokeswoman, Stephanie Reitz. At the time, the police did not apprehend Ms. Gregory. When they later learned her identity, they issued an arrest warrant, charging her with disorderly conduct and attempt to commit larceny in the sixth degree. She has been placed on administrative leave at Quinebaug, according to the arrest warrant. The college did not immediately respond to a request for comment. On Sunday, Ms. Gregory turned herself in to the University of Connecticut Police Department, Ms. Reitz said, after the university contacted her lawyer and informed him of the arrest warrant. She was subsequently released on a $1,000 bond. Her court date has been set for Wednesday. 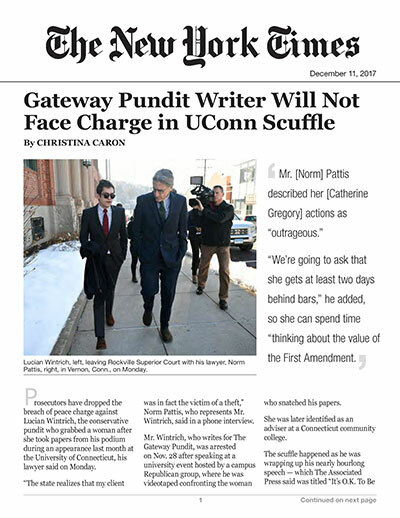 Mr. Wintrich’s website, The Gateway Pundit, gained notice last year for its pro-Trump coverage and for promoting false rumors about voter fraud and Hillary Clinton’s health. On Monday, Mr. Wintrich tweeted that justice was “finally being served,” calling Ms. Gregory a “leftist thug” in another tweet. Ms. Gregory’s lawyer, Mr. Schoenhorn, said her actions were no different than turning off a microphone. “There’s a certain level of hypocrisy going on here. And my client’s reaction was mild compared to the reaction of others in the audience,” said Mr. Schoenhorn.